It’s been five days after the visit of Democrat Party leaders and the Israeli Embassy for our project “English for all,” but positive comments still continue to arrive. First, I was contacted via email by a Bangkok Post reporter and asked me to answer a few questions regarding the project. He said he writes for the “Lifestyle” section of the newspaper, and he’s currently working on the article. I hope he gets to publish it. 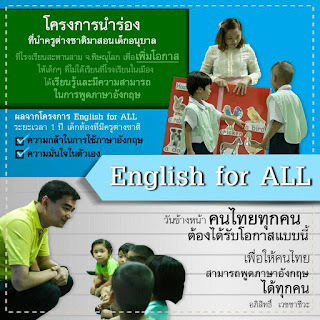 Secondly, yesterday afternoon whilst having an English lesson with former MP for Phitsanulok Dr. Warong, I learned that the director of Blue Sky Channel was bombarded with positive comments from people who watched live the teaching demonstration of Teacher Goodwill. So, the director himself decided to rerun the video that night, as well as in the morning the following day. Also, the director is planning to propose an “English for all” segment or program, where reporters from Blue Sky Channel will fly to Phitsanulok for a live coverage of the teaching demonstration of the teachers at Sapanteesam School. I hope it gets to be approved by the party as well. And lastly, the Democrat Party said they will contact the Philippine Embassy, anytime soon hopefully, to have the Ambassador invited to see the project, have a talk regarding Filipino teachers (recruitment, etc. ), and to strengthen the ties of two countries.